Have We Already Learned The Name Of Felicity Jones' Rogue One Character? Plus, could we get a trailer soon? Henry Cavill says that Batman v Superman won’t directly address criticisms of Man of Steel. Chris Evans discusses the politics of Civil War. Venture Bros. is finally returning! Plus, tons of images from Disney films, Lucifer, and Shadowhunters. So many spoilers! Making Star Wars is claiming to have uncovered the name of a major character in the film, though the CV of stunt double Gabriele Fritz. Fritz’s CV includes a credit for the film as the “Picture Double” for a character called Lysa Erso—and although it’s not confirmed specifically to be a double for Jones, it seems like that is indeed a name of one of the Rogue One characters. 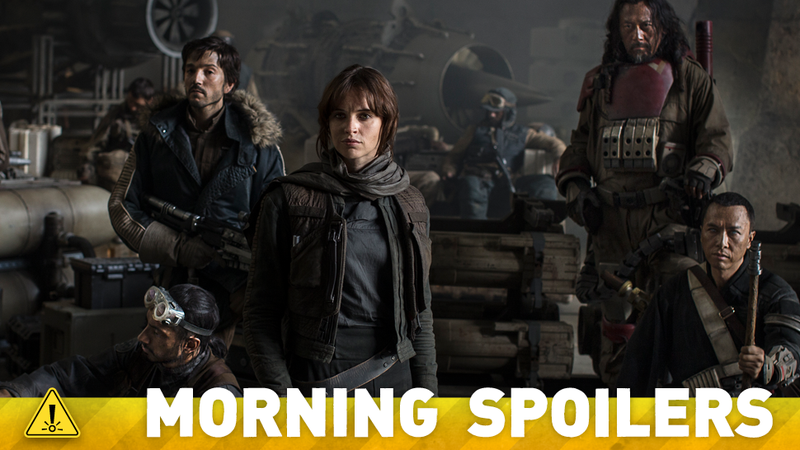 The Force Awakens trailer rumors are so 2015—2016 is the year of the Rogue One trailer rumors! This time, speculation (once again from Making Star Wars) posits that a “story trailer” for the film will be attached to Captain America: Civil War in May. There’s a great parallel that they draw between my character and Tony Stark. It’s something we can all relate to in terms of how we perceive our own society and culture, in terms of what is best for people. You can go right down to Democrat and Republican; everyone has a different opinion of what’s best…You have this team of people who are destroying every city they go to, but they’re saving the world. So it’s a matter of, do we monitor these people or do we let them monitor themselves? The beautiful thing with Civil War is that no one’s right and no one’s wrong; it’s just your personal opinion. “We’re going to have a nice evolution where you have a guy like Cap, who grew up with structure — he was a soldier and he liked hierarchy, he liked the chain of command. Now, all of a sudden, you have a guy who used to love the system not so sure about trusting it. And a guy like Tony Stark, who used to buck the system and dance to the beat of his own drum all of a sudden thinking, maybe we need some order. Disney have released a new high-res image from the film, that you may have seen before in lower resolution. Responding to the mixed reaction to Man of Steel, Henry Cavill describes the new film as not one that will address people’s complaints with the original film. The reception of my first Superman movie, from what I’ve read, was fairly mixed. Everyone I’ve spoken to enjoyed the movie, but [not] unlike if you’re going to meet a stranger in the street, they’re not going to badmouth you to your face. There’s no intentional move, I don’t think, in Batman v Superman to address any issues that people had with Man of Steel. It’s just a continuation of that storyline and they continue to develop that world and introduce new characters. I think the fun of the movie is that in the end it’s a drama. They have to figure out each other to fight each other. So it’s about what makes them tick and how that’s going to work out in a conflict. Harley is creepy, violent, crazy — all of the things that I aspire to be! It’s the fun of living vicariously through someone who is doing things that I would never do in real life. The latest TV spot for the film repositions the movie as a love story. And another new high-res still from Disney. Marvel Co-President Louis D’Esposito has posted another picture from the set, this time of what appears to be the main window of Doctor Strange’s Sanctum Sanctorum, recently revealed in concept art. Disney have released a bunch of super high-res stills from their 2016 movies—you’ve seen the images from Rogue One, Civil War, and The Jungle Book, here’s the rest, from Zootopia, The BFG, Moana, Finding Dory, and Alice in Wonderland: Through the Looking Glass. Rachel Keller has been cast in the FX/Marvel TV series. According to Deadline, Keller will play the female lead, with no extra details other than the fact that she is a wonderfully specific “scrappy, optimistic woman in her 20s.” The site further adds that her character’s mutant power may involve touching people, á la Rogue. David Ramsey has instagrammed a picture of himself hanging around outside the writers room for the show, teasing a new crossover with Arrow.